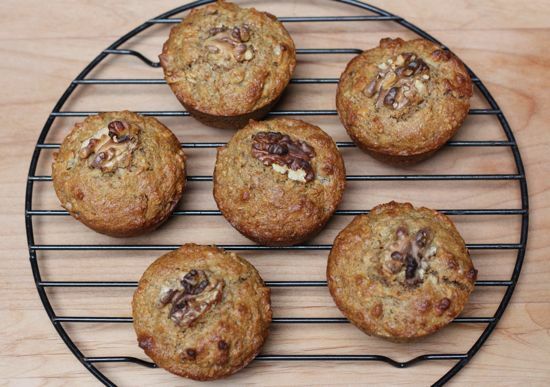 Once upon a time, bran muffins were considered health food. That was before food processors got their hands on them and muffins became overblown monuments to excess – loaded with fat and sugar, wrapped in cellophane and sold in every convenience store and coffee shop. Now a single bran muffin from a commercial oven easily can top 400 calories. The problem, of course is that the earlier bran muffins were hard to swallow. All that fiber-rich bran has the texture and flavor of sawdust and needs to be lightened up before it’s palatable to most eaters. Sugar and fat are the simplest solutions. But not the only ones. These updated muffins are the best of both eras, moist and tasty but not too sweet or rich. The secret is in yogurt and honey, which improve the texture and boost flavor. I was looking for a healthful breakfast option earlier this month when I recalled the bran muffins I used to bake from a refrigerated batter. The recipe for “Super-Natural Bran Muffins” came from a tattered copy of the “The California Heritage Cookbook,” by the Junior League of Pasadena (Doubleday, 1976), now out of print. The concept was great. Whole grains, vegetable oil, and unrefined sugars were stirred together in a fairly wet batter that was stored in the refrigerator for up to four weeks, allowing the cook to bake off however many muffins were desired at a time. It was perfect for cooks who like to serve freshly baked breads for breakfast but can’t get it together to make the batter first thing in the morning. Still, it needed a drastic makeover to suit current tastes. The ingredient list included processed bran cereal such as All-Bran and way too much sugar. The 2011 version uses unprocessed bran, less than half as much sugar as the original and substitutes a combination of yogurt and milk for the buttermilk, which can be hard to find in small quantities. Whole wheat pastry flour replaces regular whole wheat flour for a lighter texture. Muscovado sugar, a molasses-rich unrefined cane sugar available in many natural foods stores, takes the place of ordinary brown sugar. I also like to use sunflower oil instead of generic vegetable oil because I prefer the flavor, although canola will suffice. To make the muffins more interesting, I’ve added dates and walnuts. You can use any kind of dried fruit in place of the dates, but I recommend sticking with the walnuts. Although they bump up the calorie count, walnuts contribute important Omega 3 fats, antioxidants and great crunch. The basic muffin racks up 181 calories according to the calculator at caloriecount.about.com. Fully loaded with dates and walnuts, it jumps to 224 calories. The muffin is smaller than those coffee shop behemoths but it tastes far better. These are the wholesome muffins I want in January when I’m recovering from the glorious excesses of the recent holidays. They’re not only easy to bake when I want them – they’re easy on my conscience. Mix together bran and hot water in a 2-quart food storage container with lid and set aside for about 10 minutes while the bran soaks up the water. In a separate bowl, whisk together the oil, sugar and honey until well combined. Whisk in eggs, one and a time and add yogurt and milk, stirring well. Add this wet mixture to the bran in the storage container and mix. In a smaller bowl, whisk together flour, baking soda, salt and granola. Add dry mixture to the wet mixture in storage container, stirring until all the flour has been incorporated. Cover container and refrigerate batter. Batter should chill at least three hours or, preferably, overnight but will keep in the refrigerator for up to a month if tightly sealed. Dates and walnuts should be added just before baking. Before baking, preheat oven to 400 degrees and lightly oil as many muffin cups as you need. Remove batter from refrigerator and spoon as much as you will require into a smaller bowl. Count on about ¼ cup batter for each muffin. 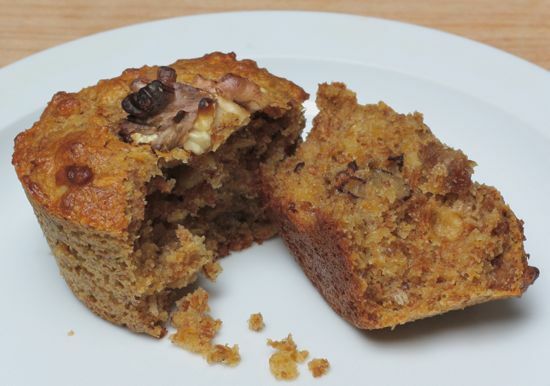 Stir in dates and walnuts (about 1 teaspoon of date pieces and 2 teaspoons of chopped nuts per muffin). Fill each cup in the muffin tins about ¾ full. Bake for 18-20 minutes, until browned and firm on top. A tester inserted into the center of a muffin should come out clean. Serve warm.